our perfectly imperfect life: 5 years old. each year nika's birthday brings with it a lot of emotion. it is a time of reflection of where we have been... and where we are now. sometimes it is easy to forget the journey we endured to bring her home. it seems as though she has always been here... yet it hurts my heart that there is so much about her past that i do not know. i cannot tell her the story of her birth. but i can tell her that she was born in st. petersburg, russia, weighing 4 pounds 3 ounces. and that she was 18 inches long. 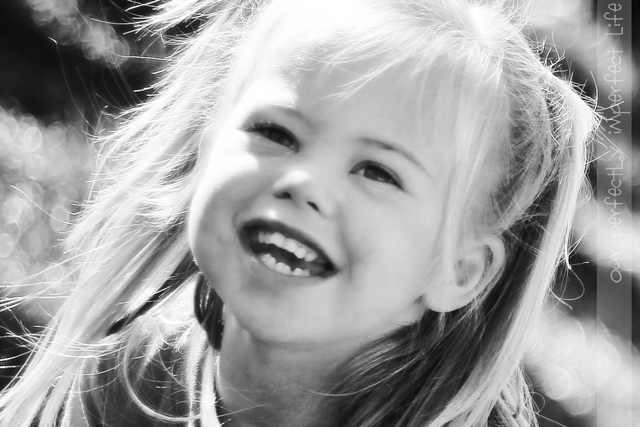 and that even though her birth parents felt they could not care for her because of her extra chromosome... there was another family half way around the world that could. and that one day we would meet. i cannot tell her what time of day she was born. but i can tell her that she was born on october 21, 2006... which was sweetest day in the usa. ironically... kyle proposed to me on sweetest day in 1998. although unbeknownst to many... that hallmark holiday has always maintained a special place in my heart. of course nika was born on sweetest day. i cannot tell her much about her birth family. but i can tell her all about our family. and how much we love her. and all about our adventures to bring her home from russia. i often wonder why her extended birth family never visited her in the two years she sat in a baby home. i often wonder why her mom refused to give us a picture of herself when we asked. i often wonder if her older birth sister knows about her. there is so much that i wish i knew. i wish i knew how to show nika's birth family that she is thriving and loving life... extra chromosome and all. that you would help another orphan that sits and waits. charlotte is in an eastern european country. she has less than three months left in her baby home. after that... she will be transferred. the family wanting to adopt charlotte is hosting a huge fundraiser. they are desperate to bring her home. for a small tax-deductible donation... you will be entered into a drawing to win a slew of prizes. $10 will go so much further than you think. and you could win an awesome prize. Love this! Happy 5 years to your beautiful girl!!!!!!! That made me cry! I wish you could tell Nika's mama this too. But for each time you wish you could tell Nika's mama, you have to know that there are many mama's learning what Nika's mama may never will. It is funny you wrote this today, because today I felt like calling you to tell you that I am SO blessed to have you as my friend. Hmmm.... I am! You are such a blessing to me. I love you sister cheese! Great post, Bethany. Happy Birthday to your beautiful Nika! Lucas turned 5 on the 15th...it's such a wonderful age. Enjoy celebrating your precious girl with the rest of your lovely family! B-E-A-Utiful picture!!! It just captures life, living, she is thriving and so full of life. I'm sorry it just screams "I love my life" to me. Happy Birthday to the "Sweetest" Nika I know :) You have an amazing family to celebrate with and one that will cherish each and every birthday from here on out. That's really beautiful. It's so wonderful that you have her and she has you. I hope that she'll be comforted in the future by all she has and not troubled by what she doesn't have. You all are truly blessed. Although I don't have a close relationship with Max's birthmom, I am always grateful that I did meet her for a brief hour or two and that I have pictures of her holding him as an infant, and even have pictures of his birthdad and bio-siblings. A true treasure. What a beautiful, beautiful girl and not too mention......so very, very lucky!! She is so beautiful!!! Thanks for the heads up for Charlotte!! Donated to that sweet little girl!! May God bless everyone!! !